For quite some time we have had a product called USB Disabler Pro. Its main function is to block or allow access to USB based flash drives. Up until recently this covered just about anything you could plug into a USB port that mapped to a drive. Due to some changes in current versions of Windows, it is now possible to connect a phone or camera, and write files to them. For a long time it did not work this way. You could only view the files on the device (Most of the time it would just show pictures), but not write to them, and actually the iPhone still works this way. But other phones from Samsung and HTC are writable. The sneaky part about it is that they don’t map to a drive letter, and you can’t even get a path to them that will work on the command line – but you can still copy files to them using explorer. We have been working on modifications to improve USB disabler for some time, but we moved up the beta schedule as soon as we became aware of this issue. After some heavy investigation and experimentation we have found a way to block any device that shows up in the “Portable Devices” category (This would be any phone or camera). In addition some long term work we have had on other parts of disabler improves the blocking engine. This includes better SD card insertion detection, and Windows 8/2012 support. This new beta of USB Disabler solves all of these problems. Since we consider this an important security issue, once this version is in a final release (Will be soon) it will be a free update for all USB disabler customers – no matter how long ago you purchased. Give the beta a spin and tell us what you think. Until March 30th you can get a site license for just $199 (US). This allows for an unlimited number of computers. After that we will move to a per-computer licensing. During this time we will also add 1 year of upgrade protection and email support at no additional charge. This is a great piece of work Steve. I have a funky USB device here that really does not fit into any of the normal device profiles, and it maps to a drive letter. Your new version catches it. Great stuff. Thanks for trying it out Mike. That is good to hear. I get an error when trying to install it on Windows 2000. Any chance of support for 2000? Unfortunately not. Under 2000 the driver notification apis are not available, and some methods for talking to the driver subsystem are totally different. On top of that MS no longer supports 2000 in their latest compilers. So we are unable to provide a working version for 2000. Does it work same as block USB drives utility comes with network administrator?? 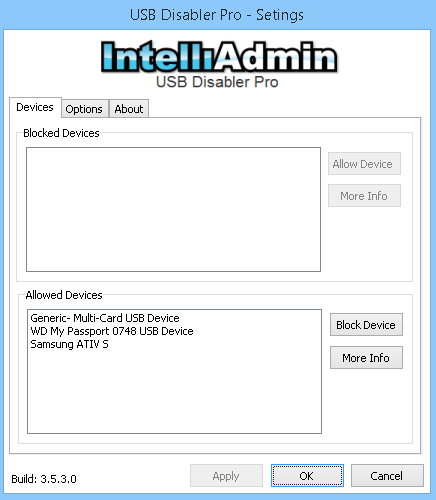 Can this USB disabler pro need to be installed on every machine and have grant access manually or it can be managed by Intelliadmin network administrator? Thanks in advance, have a great time ahead. No the two are totally different. USB Disabler runs as a service and watches for device notifications. It allows you to allow or deny a specific device. It also can block any device that maps to a drive letter. The USB blocker in Network Administrator is a simpler tool that is either on or off for all users of a computer. It uses a combination of registry settings and inf file values to stop or allow the USBStor service – which is responsible for all flash drives…but does not cover cameras, and other USB based devices that have their own drivers. It works for our network, which is why we have purchased the software.